Once you have learned your basic open position guitar chords, and maybe some power chord shapes, it’s time to move on to what are called barre chords. Yes, that’s bar with an “re” at the end. The reason why they are called “barre chords” and not “bar chords” is the Spanish origins of the guitar. But be aware that you will see these referred to as both barre chords, and bar chords. 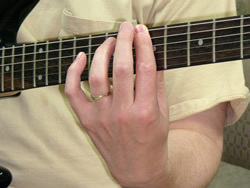 Barre chords are moveable chord shapes that can be played anywhere on the neck of the guitar. Therefore with just one major barre chord shape you can play any major chord depending on what fret you are playing on. And the same goes for minor barre chords. Although these pictures look like I have a nasty cut on my finger, I am fine. Thanks for the concern. 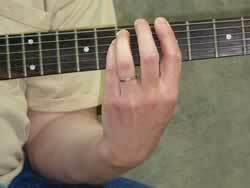 Now barre your first finger across all 6 strings of the guitar and play each note individually. (fig 2a) Any thuds? Everyone has fingers and hands that are shaped a little different, so you will have to do a little experimentation to find the right position for you. If you are not getting a sound on all of the strings, try moving your hand up a little so that your index finger is extending a little past the top of the neck. 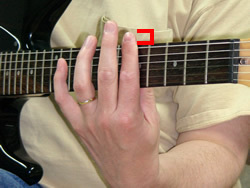 (fig 2b) Be sure and keep your thumb in the middle of the back of the neck of the guitar. 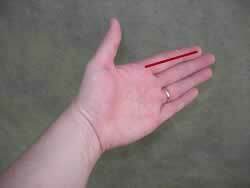 If you bring your thumb up too high you will find barre chords very difficult. The root is the primary note a chord is built from. The root of an A chord is A, the root of an Am chord is A, the root of an A7sus2 chord is A. 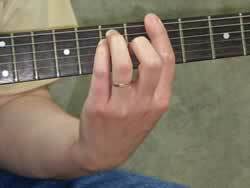 In the barre chord charts below the root is indicated by an open circle ( ). Whatever fret the circle is on, that will be the root of the chord. 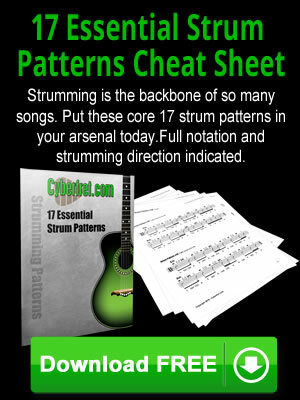 You will need to learn the names of the notes on the 6th and 5th strings to really make use of barre chords. Here are the name of the notes on the 6th string of the guitar to use as a reference. The note that gives most people trouble in this barre chord is the 3rd string. Without this note it’s not a minor barre chord. So make sure this note sounds.